Keep It Clean is the ultimate cleaner, deodorant and disinfectant for pets and their environment. It is proven to assist in the prevention of bacterial and viral infections such as Canine Distemper, Viral Haemorrhagic Disease and Myxomatosis. Keep It Clean also reduces the risk of Flystrike. It can be used for any animal including birds and can be sprayed directly onto the pets, cages, hutches, litter trays, bedding and accessories. Pet Safe is an established brand of pet products from the UK . These disinfectants have been carefully formulated and designed to increase the safety and cleanliness of a pet's environment. Not only do these products clean surfaces with minimum effort, they also leave behind an invisible barrier that continues to fight bacteria days after use. Available in Disinfectants for small animal cages (cucumber fragance) or Disinfectants for litter pan (lilac fragrance). Comes with a deck that helps keep yr bunny away from it owns litter. Deck is designed to fit just right in the corner of yr bunny's cage. Available in 2 colors: yellow & ivory. 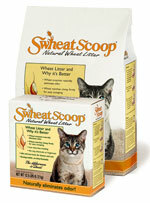 Swheat Scoop is an all-natural scoopable litter that’s made from naturally processed (non-food grade) wheat. Its natural wheat enzymes work continuously to eliminate odors, no matter how many cats you own. All Pet Pine® is made from 100% recycled pine and does not contain any additives or harmful chemicals. Pine naturally neutralizes odor and is up to 4 times more absorbent, keeping your pet critter's home cleaner. What does that mean to you? Less maintenance! The universal hygienic litter for cats, rodents and many bird species. 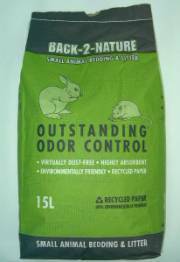 Naturally odor-binding with good absorption. 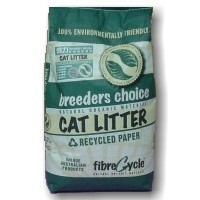 The economical eco-based product in the CAT'S BEST line: CAT'S BEST Universal Organic fiber pellets. Eco-Straw uses special technology to compress high fiber wheat straw into a pellet that is twice as absorbent as newspaper-based litter, and will absorb 300% of it's weight in moisture.When wet, Eco-Straw pellets expand and separate allowing the wet areas to be scooped on a daily basis. This eliminates waste, and lasts longer than traditional wood shavings. 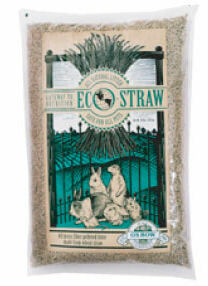 If consumed by your pet, the natural fiber from the wheat grass plant is safe and can be beneficial to the digestive system of rabbits, guinea pigs, chinchillas and other plant-eating animals.Eco-Straw is your ideal choice for a safe, dust-free litter or bedding for your pet. It is toilet flushable and beneficial to the soil when composted. Heat treatment of the pellets guarantees that Eco-Straw will be free of mites and insects. 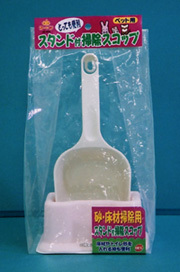 *Can be used in all cages, aquariums and habitrails. The ideal pet bedding for small animals. Superior odor control and super absorbent so your pets stay cleaner and drier. Lasts longer between bedding changes. Clean up is fast and easy because CareFRESH won’t stick to the cage or pan. The dedusted softwood shavings ensure soft and hygienic nest. The natural shavings are made from specially chosen domestic pine woods that are odour-binding and guarantee a pleasant environment just right for pets. Convenience and environmental friendliness. That’s what makes Pestell's all natural small animal bedding the choice of consumers. A wide variety of materials are heat treated prior to packaging to create a clean, absorbent, natural environment that's ideal for any small animal.